No one is more enchanted by the magic of Walt Disney World than young children. Time stands still as the stories and characters that delight and engage them become real. The smiles on their faces create memories to cherish for a lifetime. Walt Disney World has 25 themed resorts ranging from value to moderate, to deluxe resorts, to suites at Vacation Club Resorts, plus the unique Fort Wilderness Resort and Campground. Disney's Grand Floridian Resort & Spa - Built in the style of the great Victorian-era beach resorts, this flagship property has a showpiece lobby, beach and marinas, boat rentals, 40 acres,deluxe rooms, concierge category, character dining, Afternoon Tea Party for kids, evening kids club, and many other activities. The grand hotel Grand Floridian has an ideal location near the Magic Kingdom theme park at Walt Disney World. To reach Magic Kingdom, guests simply jump on the monorail right at the resort, or stroll to the dock and catch a shuttle boat. Disney's Contemporary Resort - Disney's Contemporary Resort is an ultra-modern, lakeside Disney Deluxe Resort, made up of a towering A-frame high-rise building—the iconic Contemporary Tower—and complemented by one garden wing annex. The sprawling grounds include a marina, pools, restaurants, recreational facilities, a health club, tennis courts and convention facilities. Disney's Contemporary Resort, which houses 655 rooms, is conveniently located within walking distance of Magic Kingdom theme park. The Contemporary Tower is home to most of the Resort's facilities, including Registration, Guest Services and the 4th floor Grand Canyon Concourse. This main hall houses 2 restaurants, various shops, the monorail station and a 90-foot ceramic mural created by Disney Legend, Mary Blair, celebrating the Grand Canyon and the Southwest. Boasting views of nearby Space Mountain attraction and Cinderella Castle, Disney's Contemporary Resort overlooks 4.5 miles of shoreline along Bay Lake and Seven Seas Lagoon and is the closest hotel to Magic Kingdom theme park. At the hotel's award-winning California Grill restaurant on the 15th floor, dine in comfort as you behold nightly fireworks from the Park. Disney's Contemporary Resort is the only hotel in Walt Disney World Resort to have the Walt Disney World Monorail System pass through the main lobby. Guests can pick up the monorail on the fourth floor and easily make their way to Magic Kingdom theme park and Epcot theme park. Bay Lake Tower at Disney's Contemporary Resort, a new Disney Deluxe Villa Resort, has been designed to complement the fabled styling of the classic Disney's Contemporary Resort building. Bay Lake Tower promises to deliver some of the most dramatic views available anywhere at Walt Disney World Resort. Bay Lake Tower balances a modern and luxurious experience with warm and innovative features. This description extends to its exclusive and impressive pool—complete with a unique water slide wrapped in an intriguing glass block. Restaurants, a health club, tennis courts and other recreational facilities are shared with Disney's Contemporary Resort. Bay Tower at Disney's Contemporary Resort, which houses 295 spacious rooms (equivalent to 2-bedroom Villas), is conveniently located within walking distance of Magic Kingdom theme park. Recreation at Bay Lake Tower at Disney's Contemporary Resort includes a pool and beach, and at nearby Disney's Contemporary Resort there are shops, watercraft rentals, and a massage and fitness center. Walt Disney World Dolphin Resort - Walt Disney World Dolphin Resort is a Deluxe Hotel that is ideally situated between wonder and wonderful, designed by award-winning architect Michael Graves. Inspired by Florida itself, the Resort features distinctive architectural silhouettes on grass expanses and white sand-shored Crescent Lake, punctuated by elaborate fountains and towering palm trees. With a banana-leaf mural in cool aqua adorning its exterior, this waterfront Resort hotel comprises a 27-story building with a pyramid-shaped tower and 9-story wings emerging to the south. A pair of stylized 56-foot dolphin statues—inspired by Italian Renaissance design—grace the rooftop. Across a lagoon sits Graves-designed sister resort, Walt Disney World Swan Resort. The lobby is outfitted in modern furniture in soft wood tones, specially commissioned artwork and more than 1,000 custom light fixtures—many originating from Europe and the Eastern Mediterranean. A stately dolphin fountain is a lobby highlight with murals and contemporary art located throughout public spaces. Resort hotel Guests will find miniature golf at Fantasia Gardens and Fairways, luxury pampering at the renowned Mandara Spa and swimming at five pools, including a stunning grotto pool. Walt Disney World Swan Resort - Walt Disney World Swan Resort is a Deluxe Hotel that is ideally situated between wonder and wonderful, designed by award-winning architect Michael Graves. Inspired by Florida itself, the Resort features distinctive architectural silhouettes on grass expanses and white sand-shored Crescent Lake, punctuated by elaborate fountains and towering palm trees. The cool-hued, water-front Resort hotel consists of a central 12-story building—its arched rooftop featuring 2 graceful 47-foot swan statues—flanked by a pair of 7-story wings, each topped with lighted half shells that face a lagoon. High aqua waves adorn the building exteriors. Just across the water is sister resort Walt Disney World Dolphin Resort also designed by architect Michael Graves. Walt Disney World Swan Resort's lobby is outfitted in modern furniture in soft wood tones, specially commissioned artwork and more than 1,000 custom light fixtures—many originating from Europe and the Eastern Mediterranean. A sculptural swan fountain is the lobby's centerpiece. Resort hotel Guests will find miniature golf at Fantasia Gardens and Fairways, luxury pampering at the renowned Mandara Spa and swimming at five pools, including a stunning grotto pool. Dining at Walt Disney World Swan Resort includes 5 restaurants and 2 lounges, offering sophisticated Italian food, sushi, American food, and Disney character dining opportunities. 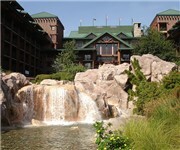 Disney's Wilderness Lodge - This Deluxe resort is on Bay Lake, near Magic Kingdom. The Lodge is modeled on the iconic Old Faithful Inn in Yellowstone National Park, with rustic exterior, 7-store lobby made of lodgepole pine, and 82-foot high stone fireplace. Theming harks back to the 1900's, with elements of Native American culture and pioneer days. Junior Suites have a living room/kitchen, large bedroom, and access to the Old Faithful Club concierge lounge. Disney's Polynesian Resort - Disney's Polynesian Resort is a relaxing tropical paradise, featuring lush vegetation, thatched roofs, koi ponds and white-sand beaches and offering a warm, welcoming world that celebrates the spirit of the South Pacific and ensures "Ho'Onanea" — the passing of time in languid tranquility. Located across the Seven Seas Lagoon from the Magic Kingdom theme park, Disney's Polynesian Resort has 11 2-story and 3-story village longhouses that flank the Great Ceremonial House—built to resemble a royal Tahitian assembly lodge—and contain 847 luxurious rooms, decorated with rich tropical colors and furnished in traditional bamboo and rattan. Disney's Polynesian Resort offers a variety of recreation, including the Nanea Volcano Pool, featuring a 40-foot high volcano with a waterfall and tubular waterslide, fishing, boating, waterskiing and parasailing on Bay Lake and Seven Seas Lagoon. Also on the Seven Seas Lagoon, a dazzling, musical Electrical Water Pageant is held nightly. Most dramatic is Disney's Spirit of Aloha dinner show, presented in an open-air dining theater in Luau Cove. A Polynesian luau complete with a feast, it combines traditional music as well as more contemporary ditties from the animated Disney film Lilo and Stitch, and features dancing that is considered some of the most authentic this side of Hawaii. Disney's BoardWalk Inn - The theme is 1930s Eastern Seaboard; the lakeside boardwalk has restaurants, shops, and nightspots. This Deluxe resort has evening kids' club, Concierge Service, health club, spa. Activities include bike-rides on the boardwalk, Surrey bikes, tennis,games, seasonal fun such as jugglers, magic shows, midway games. Luna Park carnival-themed pool area has a 200' water slide. 5-minute walk to Epcot, through the International Gateway; after the Illuminations Show at Epcot, stroll back to the boardwalk scene lit up beside Crescent Lake. Disney's Hollywood Studios is a 20-minute walk away; or take a boat to DHS or Epcot. Disney's Beach Club and Disney's Yacht Club - The Beach Club and adjacent Yacht Club have suites and concierge level, and share Stormalong Pool, over 3 acres in size, with several different areas, sandy wading area, waterslide. (Access is limited to BC and YC guests.) Activities might include campfire sing-a-long or Movie Under the Stars. Bayside Marina has cruise excursions. IllumiNations cruises are pricey but popular; guests can also see Epcot's IllumiNations fireworks from the beach. The Beach Club is considered a "Deluxe" resort hotel, and its prices are among the more expensive offered at Disney. There are Value Season, Regular Season, Peak Season and Holiday Season rates. These are regular rate prices and do not include the Florida Sales Tax nor the county resort tax. Rates are based on double occupancy. No charge for children under 17 years old when in the same room as the adults. Disney's Animal Kingdom Lodge - This luxury Disney World resort has astonishing architecture inside and out, but best of all are the giraffes, zebras, and other African animals in the savannas out back. Watch wildlife with a naturalist; then play with the kids in a big (life-guarded) zero-entry pool. Also on-site: family activities such as crafts, Simba's kids' club (evenings), spa. Disney's Port Orleans - Riverside Resort - The theme is down-south, at this Disney World resort: you can stay in Magnolia Bend (in the style of plantation houses) or Alligator Bayou. The main swimming pool has the Ol' Man Island play area. Paddleboats, surrey bike rentals, River Adventure Cruise. Take a walk to sister resort Riverside- French Quarter, or a free shuttle boat to Downtown Disney. Riverside- Port Orleans is an attractive (and large - 325 acres) resort, with Mississippi river theming in two sections: Magnolia Bend area has antebellum-style architecture along the Sassagoula River. Be sure to allow a whole day on your vacation, just to have fun at the resort. Disney's Port Orleans - French Quarter - The theme here (at this sister resort to Port Orleans Riverside_ is the historic French Quarter of New Orleans, with Mardi Gras ambiance such as carnival masks. Kids love the pool's dragon-mouth water-slide and water-spraying "Alligator Band". Walk or boat to Disney's Riverside Resort; boat to Downtown Disney, too. Located near Downtown Disney; nearest theme parks are Epcot and Disney's Hollywood Studios. Disney's Caribbean Beach Resort - Rooms at Disney's Caribbean Beach resort are in attractive two-story units with lovely vegetation: the top-floor rooms have balconies. Our room was spacious and easily slept four. (And a crib can be added for a child under three.) Six villages, named for Caribbean islands, are arranged around a large white-sand lake called Barefoot Bay; no swimming allowed, though. A 1.4-mile promenade goes around the lake, good for walks, jogging, or biking. The Caribbean Beach Resort is considered to be an Epcot Area resort, though in fact it's about as close to Disney-MGM Studios as it is to Epcot. Nearest resort is Disney's Pop Centure (a Value resort.) The resort is also fairly close to the Typhoon Lagoon Water Park and Downtown Disney. Disney's Coronado Springs Resort - A large Moderate-priced resort, with beautiful grounds and 15-acre man-made Lage Dorado, nature walk, themed Dig Site pool with Jaguar water-slide, children's pool, playground, health club. Theming is American Southwest/ northern Mexico, with plazas and a courtyard. Marina, open seasonally on on Lago Dorado, rents kayaks, pedalboats, and other boats; bikes and surrey-bikes for rent as well. Market-style food court. The resort is built around a 15-acre shimmering lake, Lago Dorado. Named for European explorer Francisco de Coronado, CS is a showcase of native architecture and landscaping. There is a stepped Mayan pyramid towering over an elaborate 120'x90' pool area with a water slide and a playground that doubles as an archeological dig site for kids. There is a jaguar perched over the water slide spitting water at guests as they slide down... and be sure to look for the Hidden Mickeys. Disney's All-Star Sports - All four of the value-priced Disney World resorts are excellent value-for-money. They're colorful, cheerful, fun, and priced under $100; rooms sleep four; and you can enjoy all the benefits of staying at a Walt Disney World resort. The All Star Sports Resort is located on Buena Vista Drive west of World Drive. It is adjacent to the All Star Music Resort, and near All Star Movies, Blizzard Beach, Coronado Springs, and Disney's Animal Kingdom. Rooms with two double beds or one king size bed are available. Rooms with a king bed are designed for disabled travelers and do not have a tub, only a wheelchair-accessible shower. Rooms are 260 sq. feet, compared to 314 sq. feet at most of the Moderate Resorts (Port Orleans Riverside and French Quarter, Coronado Springs). Disney's All-Star Music Resort - Disney's All-Star Music Resort is a 1,604-room hotel featuring giant icons that pay homage to classic music genres—including Broadway show tunes, calypso, country, jazz and rock n' roll. 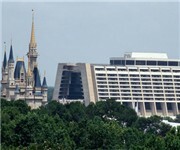 Rates at this Disney Value Resort start at $82 per night, plus tax in a standard room most nights during Value Season. Disney's All-Star Music Resort is the only Disney Value Resort with family suites. The Guest rooms at Disney's All-Star Music Resort are divided into 5 pairs of 3-story buildings—each bright, whimsical pair is themed after one of the featured music genres and decorated with massive musical instruments. The central building of Disney's All-Star Music Resort is named Melody Hall, and the facility includes the Main Lobby check-in desk, the Intermission Food Court, Maestro Mickey's shop and the Note'able Games arcade. Disney's All-Star Music Resort has 2 swimming pools—the main guitar-shaped Calypso Pool and the smaller grand piano-shaped Piano Pool. Disney's All-Star Movies Resort - Disney's All-Star Movies Resort is a 1,920-room hotel featuring giant icons that salute classic Disney films—including Disney·Pixar's Toy Story, Fantasia, The Love Bug, The Mighty Ducks and One Hundred and One Dalmatians. Rates at this Disney Value Resort start at $82 per night, plus tax in a standard room most nights during Value Season. The Guest rooms at Disney's All-Star Movies Resort are divided into 5 pairs of three-story buildings—each pair themed after one of the featured movies. For example, the Toy Story section features a 27-foot-tall bucket of Green Army Men, a 30-foot-tall Woody icon and a 47-foot-tall Buzz Lightyear icon. The buildings are painted in bright colors and covered with playful details and hidden surprises. Disney's All-Star Movies Resort has 2 swimming pools—the main Sorcerer's Apprentice-themed Fantasia Pool and the smaller Duck Pond pool shaped like a hockey rink and inspired by The Mighty Ducks. 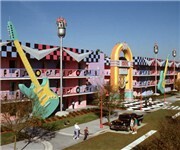 Disney's Pop Century Resort - Disney's Pop Century Resort is a 2,880-room hotel featuring giant icons that salute many of the 20th-century popular culture crazes—including toys, gadgets, music, movies, fads and catch phrases. Rates at this Disney Value Resort start at $82 per night, plus tax in a standard room most nights during Value Season. The Guest rooms at Disney's Pop Century Resort are located in 10 brightly colored and whimsically decorated 4-story buildings—trimmed with huge letters representing iconic saying from the decade they represent. Different sections of the hotel represent the 1950s, '60s, '70s, '80s and '90s. The central building of Disney's Pop Century Resort is named Classic Hall, and the facility includes the Main Lobby check-in desk, the Fast Forward arcade and the Everything Pop shop and food court. Disney's Pop Century Resort has 3 swimming pools—the main flower-shaped Hippy Dippy Pool, the smaller bowling pin-shaped Bowling Pool and the monitor-shaped Computer Pool. Fort Wilderness Resort & Campground - Like the Wilderness Lodge, this property is on Bay Lake; guests can take a boat to the Magic Kingdom, or use the Disney bus system. Fort Wilderness is the only place to camp at Disney World, and campers get all the perks of staying at a Disney World Resort. Cabins at Fort Wilderness are a great option for families, too; they sleep six and have a fully equipped kitchen. Disney's Vacation Club Old Key West Resort - Escape to a charming community that recalls the spirit of the Florida Keys. Immerse yourself in the tropical ambiance of a quaint Key West style resort in the early 1900s as you delight at the brilliant green landscapes, Victorian themes, soothing pastels and quaint details of this picturesque retreat. At day's end, laugh and relax with your family in your light and bright vacation villa featuring the comforts and conveniences of home, plus all the romance and adventure of turn-of-the-century Key West. Celebrate the whimsy and wonder of the Florida Keys as you explore the wide array of recreation & entertainment options. Whether you're looking to exercise your body or your mind, you will find the ideal activity to ensure a magical vacation for the entire family. Disney's Vacation Club Beach Club Villas - The white sandy beaches and large water slide complex of Disney's Beach Club are situated on a lake adjacent to the Epcot theme park. Disney's Beach Club has a more casual decor than its sister resort, Disney's Yacht Club. Disney's Vacation Disney's Saratoga Springs - Disney's Saratoga Springs offers a range of accommodations from standard guest rooms to residential-style, three-bedroom, two-story villas that sleep up to twelve people. The theming of Disney's Saratoga Springs is upstate New York at the turn of the century, and there are charming details everywhere you look. Magical Beginnings presented by PLAYSKOOL® is a new programme devoted to families with little ones. Designed to make a Disney holiday with young children easy and fun, it's the perfect introduction to planning an enchanting visit. With age-appropriate attractions, entertainment, special services and awesome special events, Magical Beginnings makes travelling a breeze. For Toddlers, we recommend attractions that emphasise fun over fright. We've included live shows and parades in which beloved Disney Characters spring to life, and recreational activities that are at a kid's pace.